356 pages | 30 B/W Illus. Ecological economics explores new ways of thinking about how we manage our lives and our planet to achieve a sustainable, equitable, and prosperous future. Ecological economics extends and integrates the study and management of both "nature's household" and "humankind's household"—An Introduction to Ecological Economics, Second Edition, the first update and expansion of this classic text in 15 years, describes new approaches to achieving a sustainable and desirable human presence on Earth. Written by the top experts in the field, it addresses the necessity for an innovative approach to integrated environmental, social, and economic analysis and management, and describes policies aimed at achieving our shared goals. The book begins with a description of prevailing interdependent environmental, economic, and social issues and their underlying causes, and offers guidance on designing policies and instruments capable of adequately coping with these problems. It documents the historical development of the disciplines of economics and ecology, and explores how they have evolved so differently from a shared conceptual base. Structured into four sections, it also presents various ideas and models in their proper chronological context, details the fundamental principles of ecological economics, and outlines prospects for the future. 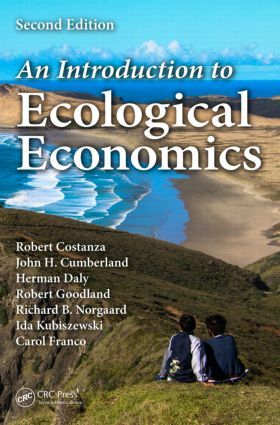 An Introduction to Ecological Economics, Second Edition can be used in an introductory undergraduate or graduate course; requires no prior knowledge of mathematics, economics, or ecology; provides a unified understanding of natural and human-dominated ecosystems; and reintegrates the market economy within society and the rest of nature. "… summarises the ‘state of the art’ in the discipline. …The ecological threats posed by the modern market system and its use of advertising to promote consumption are extensively discussed. … a useful handbook." "… a useful transdisciplinary lens through which to view and understand stubborn global problems of inequity, environmental degradation and declining well-being. It challenges the traditional use of GDP as a metric of progress and argues for an approach more in tune with the challenges of the 21st Century , one that builds and values stronger socio-ecological systems as the only way of ensuring transformative change for all in an increasingly full world." "… a unique tool to approach issues that are vital for the future of the planet and of our societies. It is a fundamental book to deeply understand the complexity of the issues at stake, as well as the need to connect multiple disciplines to find the right policy solutions to today and tomorrow challenges." —Enrico Giovannini, University of Rome "Tor Vergata"
"This book addresseses the most important problems facing both people and planet, and challenges conventional thinking. It is essential reading for anybody who wants to understand the connections between wellbeing and environmental sustainability, and how to envision a better future for us all." "Coming from the people who, more than anyone else, have pioneered and developed the subject, this book is much more than an introduction to ecological economics. It provides a through grounding in a field that that should be becoming central to modern political and economic policy and thinking." Robert Costanza is professor and chair in public policy at the Crawford School of Public Policy at The Australian National University. His transdisciplinary research integrates the study of humans and the rest of nature to address research, policy, and management issues at multiple time and space scales, from small watersheds to the global system. He is co-founder of the International Society for Ecological Economics and founding editor in chief of Solutions (www.thesolutionsjournal.org). He is author or co-author of over 500 articles and 27 books. John Cumberland is a professor emeritus at the University of Maryland, where he served as a professor of economics and the director of the Bureau of Business and Economic Research. His teaching, research, and publications have been primarily in the fields of environmental and natural resource economics. He is currently a senior fellow at the University of Maryland Institute for Ecological Economics (IEE). Herman Daly is the author of many works on ecological economics. He is a professor emeritus, at the School of Public Policy, University of Maryland, and a former senior economist with the World Bank. He is cofounder of the ISEE and won the Netherlands Royal Academy Heineken Prize and the Right Livelihood Award in 1996 for pioneering the new discipline of ecological economics. Robert Goodland was the environmental advisor to the World Bank Group in Washington, DC, between 1978 and 2001. The Library of Congress lists 41 of his publications. He served on the independent Extractive Industry Review of the World Bank Group’s oil, gas, and mining portfolio (2001–2004) and then became a senior fellow at the World Resources Institute. He was elected chair of the Ecological Society of America (Metropolitan) and president of the International Association of Impact Assessment. Robert Goodland passed away unexpectedly in 2013. Richard B. Norgaard is a professor emeritus of energy and resources at the University of California, Berkeley. He acquired his skepticism for market exuberance while earning his PhD in economics at the University of Chicago. He has professional experience in Alaska, the Brazilian Amazon, California, and to a lesser extent in Africa, China, and Vietnam. He helped bring a coevolutionary framing to our understanding of socioecological system dynamics. He is currently writing on "Economism and the Econocene" and "The Challenges of Collectively Understanding Complex Systems." coauthor of more than a dozen scientific papers in the field. Carol Franco is a senior research associate at Virginia Tech University. She is an ecological economist experienced in food security, ecosystem services, and policies for economic development and climate change mitigation and adaptation. She has participated in negotiations of the United Nations Framework Convention on Climate Change for four years now as a member of the Dominican Republic delegation. Her current responsibilities include working with government institutions on REDD+ policy frameworks on the ground in Mexico, Peru, Colombia, and the Dominican Republic.